The Independent India: A VIP meeting is more important then the life of an ordinary man in INDIA. A VIP meeting is more important then the life of an ordinary man in INDIA. Friends there are many things in the world which occurs only in India and I am listing hear one of them . I don't know why is a politician, Political leader etc are given more importance then an ordinary men. and I don't know why the political leaders , politicians , IAS , RAS etc think that they are having more powers then a common citizen of India. And I don't understand that why they forgot that the income which they are paid is paid by the common citizen of India. The tax which a common man pays is only the source of the income of these people. And now a days even a life of common man had become more important then the meetings of Very important people(VIP) of India. I don't understand that why the roads are not empty when the ambulance passes from that road and why is there even not a single vehicle when a car with RED light passes from the road. 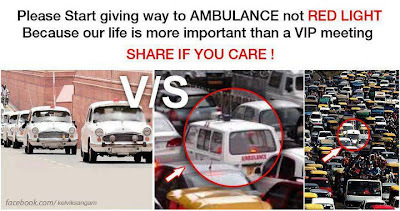 Actually we are the only one who are giving more importance to a VIP rather giving more importance to an AMBULANCE in which there is a patient who is praying to god that he can reach to the hospital as fast as possible. Please start giving way to AMBULANCE instead of cars with RED lights carrying VIP's.